��Rev Brown had the crowd going � the mood was really exciting with most folks standing. Once I thought I felt the floor joists shake! It was quite a Home Going! Burnell Brown would have really enjoyed it! 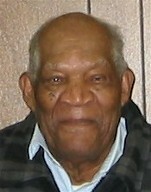 A long-time client and friend, Burnell Brown, died on December 17, 2008. A couple of reporters called me for comments. There is much to remember about “Deacon Brown”.He was active and stood tall in this community for a long time! I knew Burnell Brown as a client, political supporter, storyteller and friend. We worked together on legal matters over a period of 35 years. He has been in declining health for about two years and I have not seen him as much. Betty and I sent him cards and notes on a regular basis and checked on his status. 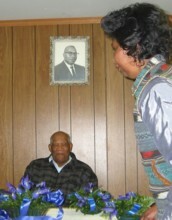 We attended his funeral at Bethel Baptist Church, Watkinsville, GA, on Saturday, December 20, 2008. The church was filled with family and friends- many standing and an overflow group watching by television in the basement fellowship hall. It was both a sad occasion and a joyous one. The program for the service was titled “Celebration of the Home Going of Deacon Burnell Brown”. Several persons spoke, mostly ministers. Amrey Harden spoke of his relationship and time BB spent at Oconee State Bank greeting people. Most speakers had some funny anecdotes to share. Rev. W. R. Brown, Burnell’s grandson, delivered the eulogy. He described some of his grandfather’s favorite songs and actions. Rev. Brown told about experiences of growing up around ‘Pa Pa’. Many of the incidents brought smiles and laughter. He sang some of Deacon Brown’s favorite songs. The last one was joined in by the Gospelettes and the congregation along with musical instruments accompaniments. Rev Brown had the crowd going – the mood was really exciting with most folks standing. Once I thought I felt the floor joists shake! It was quite a “Home Going”! Burnell Brown would have really enjoyed it! Betty and I were glad we attended and stayed for the entire service. We had meant to come and pay respects and leave after a respectable time. However, we were ushered to the front pew and stayed until it was over almost two hours later. We shared in the memories and laughter. It was a great experience and I know Burnell would have loved it! Much has been said about Burnell Brown.I wrote an article about him on the occasion of his 90th birthday that appears below. Flagpole Magazine carried an article about him on September 6, 2005. Mr. Burnell Brown recently had his 90th birthday and a mutual friend, Joe Ann Mitchell, wanted some pictures of him with the flowers at Bethel Church. We met there on Monday, February 2, 2004. A mutual & dear friend (and long-time neighbor Joe Ann Willoughby Mitchell who has been battling cancer for the last few years) called me early on Monday morning (February 2) and asked me to come by Bethel with my digital camera and take “Mr. Brown’s” picture with the flowers that she and others had arranged for a church activity. I gladly did it and enjoyed spending time with two long-time special friends. Burnell Brown has been a friend and client since I moved back to Watkinsville to practice law in the summer of 1970. He was a confidante and supporter during my many years in public office. As Commission Chair in 1994, I had the honor of attending Mr. Brown’s 80th birthday celebration in the Bethel Church Fellowship Hall. “Burnell” is well-known around Watkinsville and Oconee County as a long-time member and leader of Bethel Church. He has also been known for decades as an influential person for political races. He has been contacted for many a campaign over the years. His advice and support were always helpful to people who he trusted. I can remember many situations when he and I spent much time together. In the early 70’s, we spent a Saturday afternoon at the Courthouse waiting on Court activities. He regaled me with many a story about Watkinsville history and not just the kind recorded in newspapers and history books. It was my first introduction to the “Sewer Cat Club” of the 30’s, 40’s and early 50’s. There were several stories of romantic involvements, “liquoring-up” and some killings— (involving whites on whites and wives on husbands)! Burnell has told the story many times about how he showed his then employer (a white large landowner) how to plant Irish Potatoes by “signs”—using the almanac. His “sign” potatoes were much bigger in a test they tried. After that, his employer “..paid me $ 10.00 not to tell the other employees…” how they decided when to plant the potatoes after that! For years, Burnell Brown cut the grass and kept the Watkinsville Cemetery looking nice. He also drove an Oconee County School bus for many years. He was loved by the students and respected by other drivers and school officials. He has served on many committees for the community. Burnell Brown is still able to “get- around” well without a walker or crutches and without serious knee or other joint problems. He is downtown daily and greets a lot of people. He will probably make it for another decade. If so, I hope that Joe Ann Mitchell and I can both be there to help him celebrate his 100th! Burnell Brown is a local treasure and I am honored to call him my friend. Oconee County civic and political leader Burnell Brown, a stalwart in his church community, died Monday night at age 94.